Sihanoukville seems to be the favorite recreation place of our Khmer friends away from Phnom Penh, the capital city of Cambodia. When we first went there in 1998 we found out why. Unlike neighboring Thailand and Vietnam, Cambodia does not have a long coastline. A relatively short portion of land on the Gulf of Thailand in the southwest is the only part of Cambodia bounded by the sea. 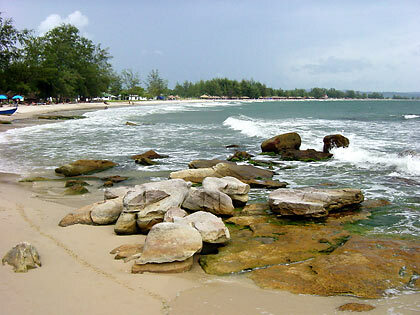 It is here where Sihanoukville, locally known as Kompong Som, is located. There aren’t too many coastal communities here since a major portion of this strip of coastal land is occupied by the Boutum Sakor National Park, leaving Sihanoukville as one of the few places with accessible beaches. Travel to Sihanoukville from Phnom Penh is along the National Highway 4, which even during 1998 was already a well-paved roadway, ensuring that Sihanoukville would be a favorite destination. Named after Cambodia’s King Norodom Sihanouk, the city is famous in the country for its many beaches with such names as Occheuteal, Serendipity, Victory, Otres and Sokha. There are guesthouses, restaurants and bars right on several of these beaches along with a few resorts but the atmosphere is pretty much laidback. The sand is mostly creamy-white or beige in color. 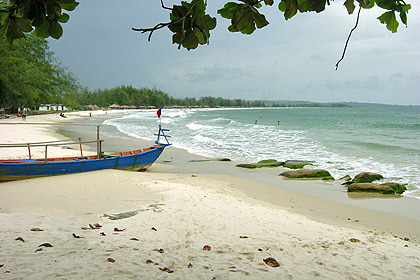 Several small islands are visible from the beaches and hills of Sihanoukville and trips can be arranged to these locations. We helped organize retreats and conferences in Sihanoukville for our old organization a couple of times, renting some resorts right by the beach each time. The town center itself is not too far from the beaches and it is possible to go around town by motorcycle taxis or the ubiquitous tuk tuks or three-wheeled auto rickshaws similar to the tricycles of the Philippines. 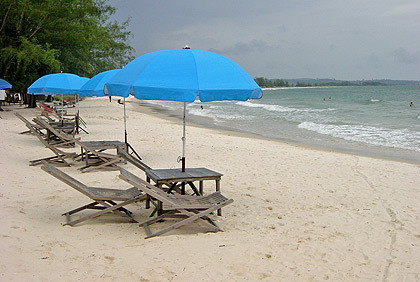 The quality of the beaches in Sihanoukville is pretty satisfactory for us. 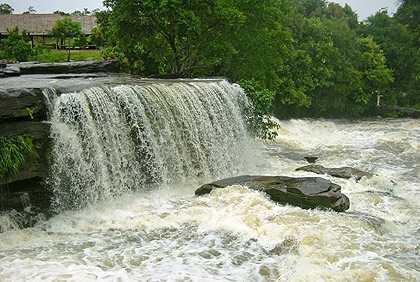 However, having come from an archipelago with a coastline longer than that of the U.S. and filled with hundreds of beaches, we weren’t as attracted to the beaches of Sihanoukville as much as the Kbal Chhay Waterfalls. 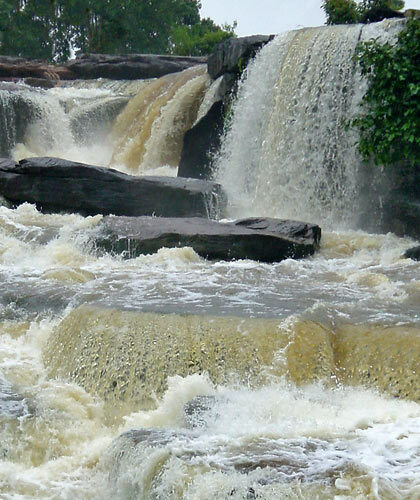 Located just 30 minutes away from Sihanoukville, Kbal Chhay is actually composed of several falls varying in height from 3 to 14 meters. 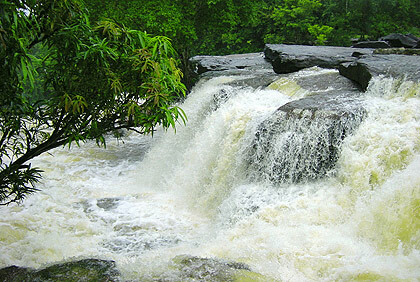 To reach these falls we motored along National Highway 4 from Sihanoukville in the direction of Phnom Penh. 7 kilometers into the journey we turned left on an unpaved road (there is a sign pointing to the site), driving 9 kilometers along this track until we finally came to our destination. 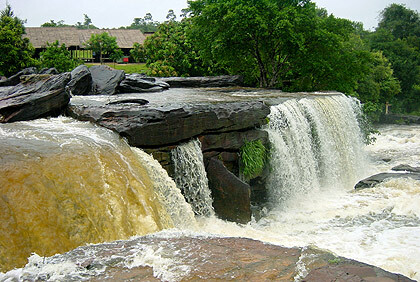 The Kbal Chhay Waterfalls are best viewed during the rainy months. When we visited Kbal Chhay it was during the monsoon season (usually between July and October). It so happened that this was the best time to see the falls as the Prek Tuk Sap River cascades down in frothy white torrents at the site. Our timing couldn’t have been better. We were told by locals that during summer or dry season the falls are reduced to a trickle. Once can sense the power of water from these photos. There are places for picnicking and even several stands that offer food and drinks. However the place is still relatively pristine, surrounded by green vegetation. It was tempting to get as close as we could to the waterfalls but it meant establishing our footing on some really slippery rocks, some of them near the edge of the cliffs. We were told that some visitors have slipped and plunged to a watery grave when they tried to do this. Still, we couldn’t help but be awed as we watched the Kbal Chhay in its display of both power and beauty.